The Roman Emperor Justinian took power when his uncle, Justin, died in 527 AD. 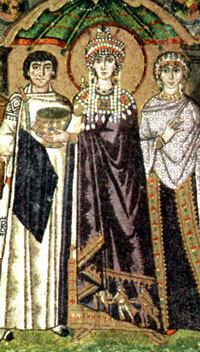 Before becoming emperor, Justinian married Theodora. That upset a lot of people because she was an actress. Many Roman people thought all actresses were bad women. But in fact Theodora made a good empress. Justinian seems to have loved her very much, even though they never were able to have any children. Soon after Justinian became emperor, there was a huge riot in the city: the Nika Riot. The rioters burned down Constantinople’s main church. 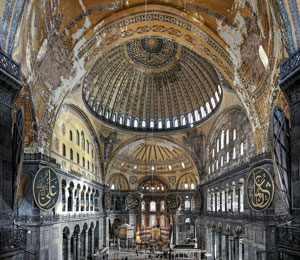 Justinian replaced it with the great church of Hagia Sophia. Justinian made peace with King Khosrau of the Sassanids in 532 AD, agreeing to send money to Khosrau every year instead of fighting. The peace made it possible for him to send Roman troops to reconquer Africa from the Vandals, Italy from the Ostrogoths, and Spain from the Visigoths. We call this the Byzantine Reconquest. Justinian also issued a new law code, the Corpus Juris Civilis, in 534 AD: this list of laws in Latin replaced the older Theodosian Code. Justinian’s code made it clear that being a Roman and being a Christian were now essentially the same thing. The code placed new restrictions on Jewish Romans. Interior of Hagia Sophia – Justinian had this great church built. On the other hand, Turkic and Slavic armies made many raids into the Roman empire during Justinian’s reign, especially in the Balkans. And, beginning in 542 AD, there was a terrible plague throughout the Empire, which may be the first appearance of the bubonic plague. Where did the Slavs come from? Did you find out what you wanted to know about the Roman emperor Justinian? Let us know in the comments! Cite this page: Carr, K.E. Justinian – Byzantine Reconquest – A later Roman emperor. Quatr.us Study Guides, August 2, 2017. Web. April 23, 2019. Sorry, you don’t think what?